Old-style logging left scars on the landscape, but nearly 40 years ago, research in Oregon changed tree-cutting practices. Now researchers are joining landowners to update the science behind modern forest management. Hinkle Creek researchers are measuring water flows, trapping insects, tracking fish and monitoring amphibians. To the list of problems for watershed research, add dam-building beavers. Last fall, in the rippling waters of Flynn Creek near the Coast Range town of Toledo, Oregon, scientists had placed a probe to take continuous measurements of dissolved oxygen. When the instrument shut down abruptly, hydrologist George Ice went to check. “I saw that the cord was cut,” he says. “A beaver had gnawed it off and stuffed the probe into its dam.” The amused vendor, the Hach Company, provided a free replacement. of 1971, the first in the nation to address water quality protection. Back then, harvesting activities weren’t particularly kind to aquatic systems. Fish-bearing streams were literally buried in wood debris, says Ice. Logs might be dragged across or even down channels without regard for the bed and banks. 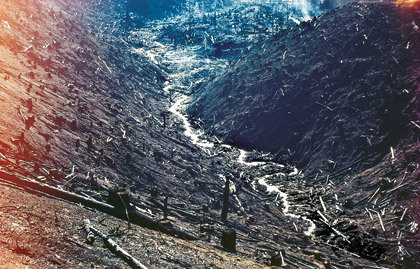 Loggers sometimes removed and burned debris because of concerns that it would impede fish movement. Without riparian vegetation to hold soil and shade streams, sedimentation and water temperatures increased. To update the scientific basis for forest management practices, teams of scientists from OSU, federal and state agencies have joined forest landowners in a three-pronged initiative. In the watersheds of the Alsea River, Trask River (east of Tillamook) and Hinkle Creek (east of Sutherlin in the Cascades), they are installing monitoring equipment and collecting water-quality data. They are measuring water flows, sediment concentrations and changes in water chemistry and stream temperature. In headwater streams and below tributary junctions, they are evaluating aquatic food webs by studying organisms from the smallest midges and stoneflies to the steelhead, salmon and cutthroat trout that have run in these waters for eons. These aren’t majestic, old-growth tracts. They are the kind of working industrial forests that comprise just under half of Western Oregon’s forestlands. For scientists and land managers, the questions are about more than the complexity of forest ecosystems. They’re also about balancing environmental quality with economic value, the health of fish populations with tree harvesting, the quality of water downstream with the need to build roads in steep terrain. Reliable answers to such questions will take time. In the Trask River Watershed, studies began in 2006, and harvesting won’t occur until 2012. In the Alsea watershed, monitoring has been conducted off and on since 1959, and no harvesting is projected until 2009 or 2010. However, at Hinkle Creek, the first answers are starting to trickle in. Three master’s students have completed their theses on summertime stream temperatures, cutthroat trout survival and down-stream propagation of temperature effects. Scientists have accumulated five years of data at nearly 50 locations. 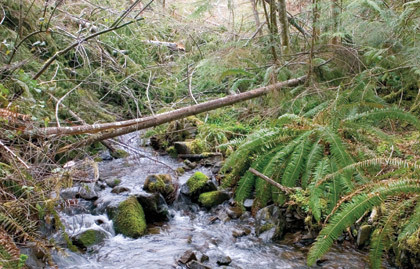 In the winter of 2005-06, the landowner, Roseburg Forest Products, cut the first trees, and researchers are beginning to analyze stream ecosystem changes. The 4,534-acre Hinkle Creek watershed was last harvested in the 1940s. A continuing round of cuts is planned for the South Fork, but Roseburg Forest Products has agreed not to harvest trees on the North Fork until 2011, thus leaving it as an undisturbed control. The experimental design is known as paired watersheds. During the pre-harvest phase, researchers confirmed that the two watersheds can be used as predictors of each other. To date, researchers have installed nearly a quarter-million dollars’ worth of equipment. In the winter of 2005-06, the company harvested 380 acres in five units in the South Fork, enough to deliver 3,281 truckloads of logs to local mills. Harvest blocks were located in non-fish-bearing headwaters, where regulations do not require riparian buffers. Next winter, harvesting operations are scheduled for land along downstream fish-bearing reaches. Networking is key in watershed science. The WRC spurs collaboration by researchers from OSU, government and private companies. When Kelly Kibler was looking for graduate schools, the Pacific Northwest caught her fancy. Within days of arriving in Corvallis in June 2005, the dreadlock-wearing forest engineering master’s student from North Carolina hustled down I-5 to Sutherlin to join Skaugset’s hydrology crew at Hinkle Creek. Mornings began with loading sample bottles, fluorescent dye, batteries and other gear into a pickup. Once past a yellow gate a half-hour outside of town, the crew left the pavement on Roseburg Forest Products’ gravel logging roads. Kibler threw herself into the project, serving as a crew member and focusing her own thesis on water temperature impacts from logging. “It was exactly the kind of work I wanted to do. Multi-disciplinary across the sciences, physical and ecological, policy and management. Pretty applied. Just the ticket,” she says. Working with Skaugset, Amy Simmons (faculty research assistant), Tim Otis (master’s student in forest engineering) and Nick Zegre (Ph.D. candidate, forest hydrology), Kibler helped to maintain computerized water-sampling devices and data recorders that monitor water temperature. She ran tests on water samples containing fluorescent dyes to determine how much groundwater was entering streams. She carried 40-pound marine batteries sometimes as far as a half-mile from the road to keep equipment operating. She reached under slash, logging debris left over headwater streams, to take measurements of light reaching the water. For her master’s thesis, Kibler analyzed stream temperature profiles in six streams, four located just below clearcuts in the South Fork and two in the unharvested North Fork. She controlled for changes in weather and other conditions and compared data from pre- and post-harvest periods. Her findings were mixed and unexpected. In the South Fork, daily maximum temperatures dropped in one stream, rose in another and remained unchanged in two. However, mean temperatures decreased in all four, possibly reflecting the influence of slash cover and increased groundwater flow into the streams. Branches left by logging operations cast shade over the streams roughly equivalent, she found, to the original tree canopy cover. “Without that slash, all four streams might have been significantly warmer after harvest,” says Kibler. In addition to being a research lab, Hinkle Creek provides an educational setting for more than 600 Roseburg fifth-graders who visit the watershed every year, says consulting forester Javier Goirigolzarri. High school students and the Oregon Board of Forestry have also toured the research sites. “The Watersheds Research Cooperative is probably the leading effort (in the United States) to look at the effectiveness of contemporary practices,” says Ice. The future of forest policy is at stake. Results from the Hinkle Creek, Alsea and Trask projects may guide regulation as attention is focused more on watersheds than on single pollutants, more on how watersheds respond to disturbance than to whether pollutants such as sediment and organic materials exceed a threshold level.